How much does it cost to DJ a wedding? Your wedding day will be a whirlwind of activity from the emotional “I do” to greeting and mingling with guests from near and far, so it makes sense that you’d want to secure a professional DJ to aid you in keeping the event running smoothly. The best DJs do much more than sit back and play music. They are the MC of your big day, announcing you and your new spouse, your wedding party, and your parents, and they keep the event running smoothly. Quality equipment, supplies, and sound system: is it provided by your venue or is something extra required? Let’s start with leadership involvement because this is key. Are you looking for someone to kick off the event with introductions and keep the event moving by timing announcements at the right times when the photographer and videographer is prepared, such as toasts, cake cutting, and first dance? 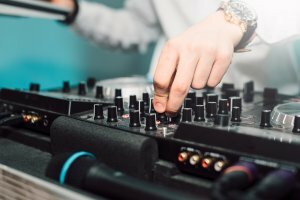 Or are you looking for the DJ to not be talky, but rather focus on keeping the guests on the dance floor through his music selection? The old adage you get what you pay for is not always the case. Some DJs undercharge, some overcharge and just because the price tag for one DJ is higher than another doesn’t mean they will be worth the extra bucks. Do they have a business license, liability insurance, a professional contract? Quality equipment? Don’t be fooled by a slick website and brochure. Anyone can talk a good game online. At Entertainment Unlimited, we always recommend that you meet with a DJ candidate in person. Have a face-to-face consultation. Ask them to stand and do an introduction for you on the spot. Do they have the right demeanor? Body language? Do they come across as genuine or cartoony? As with anything, check online reviews, call references, ask venues, use word-of-mouth. Ready to get this party started? Call us today to schedule an appointment.